‘Tis the season to pour melted butter on *&^#! –Me. Festive and classy. That Jason is one lucky guy. I did mean it when I said that the internet will always have room for one more baked slider recipe. And I did mean it when I said that this was the season to pour melted butter on [mommy word]. Of course, I mostly said that because I have two more slider recipes hanging out in my drafts folder. And I mostly said [mommy word] because that’s just who I am when my 3 year old isn’t around to hear it and then put me in time-out. You have never seen a power trip like a 3 year old with that kind of power. But back to those sliders. These buttery bites of magical cookery are the best thing to happen to holiday flavors since… Maybe I’m stretching, here. But, they do come slathered with a spoonful of Bacon & Cranberry Chutney and topped with browned butter with cripsy, salty bites of prosciutto and crunchy slivers of sage leaves. And then they’re baked until the cheese gets all melty and starts oozing out the sides. Is it an appetizer? Dinner? Breakfast? Something to grab on one of those “just because” trips through the kitchen? 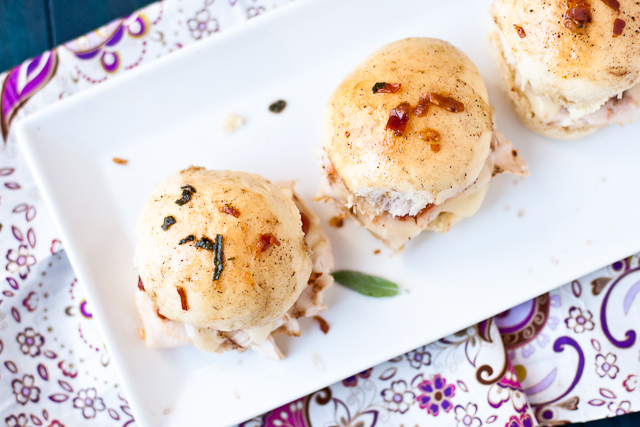 Repurpose holiday leftovers into a baked turkey slider topped with browned sage butter. Preheat the oven to 375 and line a large baking pan with foil. In a small sauce pan over medium heat, melt the butter and cook until browned, frequently scraping the bottom of the pan with a rubber spatula. Remove from heat and add the prosciutto and sage, swirling to mix. Slice the rolls in half horizontally (if you break the rolls into 2 halves of 6, you can do this with 4 cuts and not squish the bread). 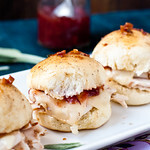 To build the sliders, top the bottom roll with a slice of turkey (folded to fit), a quartered piece of cheese, a spoonful of the chutney, and the top roll. Place rolls close enough on the pan that they're nearly touching. After all rolls are assembled, brush butter sauce onto the rolls and spoon the prosciutto and sage leaves over top. Bake for ~15 minutes and serve hot. Or warm. I don’t curse very often at all but The.Boy is going to be put in time out CONSTANTLY by our future children. I can feel it. They look so delish. Pinning! No you didn’t. 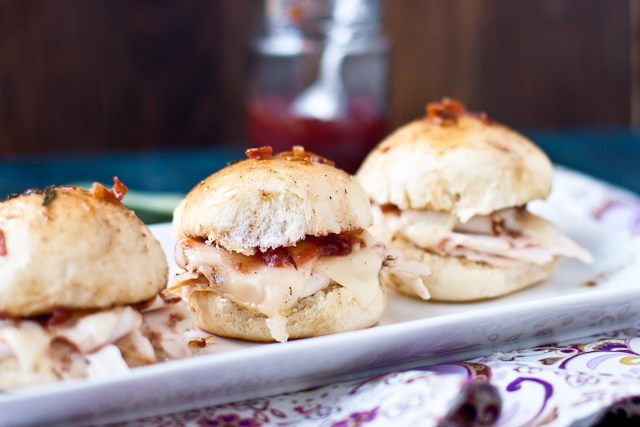 You also know that I eat the ham & cheese sliders, oh I don’t know…everyday if I could. Will be fun to switch it up with these festive little guys! woah, and yes, okay, good, I can smell and almost taste these little guys already. The idea of them is helping me pass the time during this kid imposed time out. I’ll wait until this time out is over and then I will go rustle some up. 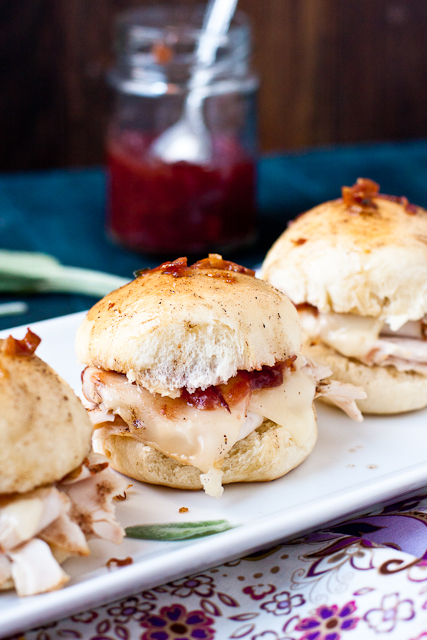 I tried these sliders and they were DELISH!